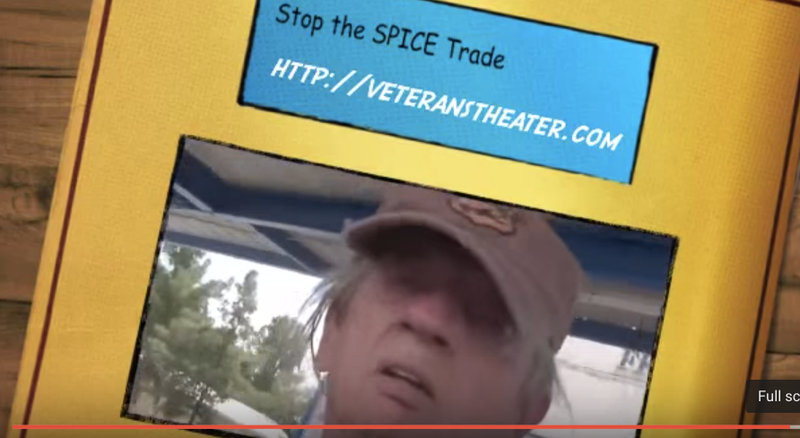 On September 11, 2015, Ernest Ramey (President of Veterans Theater) and myself (Storytelling Researcher) decided to investigate the Spice Trade, here in Las Cruces, New Mexico. I put on beat up cap, someone had donated to the homeless veterans of America, and set out to buy some Spice from a local business establishment. This business had been raided just 2 days ago by the Las Cruces Police Department, who is cracking down on the spice trade. There is no back alley drag exchange in the Spice-Fractal-Epidemic, rather, you just pull up your pickup truck at the drive through window of a business called a smoke shop, and issue the secret code word of the day, which, September 11th, was ‘Blue.’ When you smoke Spice, all bets are off, you have no idea what some Breaking-Bad-Lab mixed into the new designer drug. 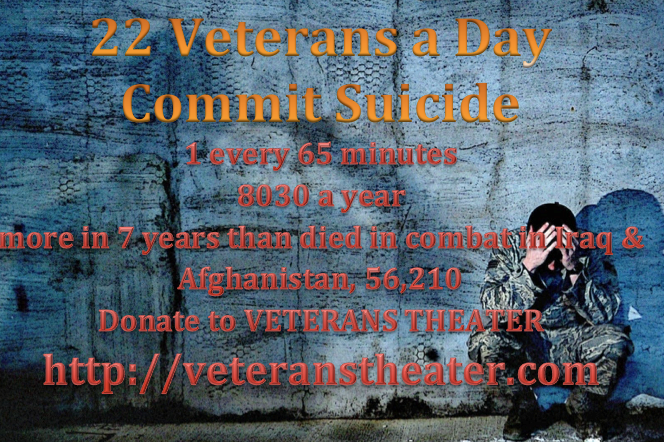 Our Veterans Theater street theater, is something known far and wide as Boal’s Theater of the Oppressed. We engage in street theater, as two Army veterans, bringing awareness of the extent of the Spice epidemic. But, what is the antenarrative here, the BEFORE, and the BET on the Future, yet to be realized? What is the BEFORE, the strange history of SPICE? In this age of madness, in 1984 the Institutional Review Board (IRB) of Clemson University, turned down Professor John William Huffman, now professor emeritus of organic chemistry, to study the effects of actual marijuana on undergrads, in-order-to research multiple sclerosis, and HIV/AIDS. So he invented Spice (aka K2), the first synthesized cannabinoid compounds, resubmitted his IRB proposal, and it was approved by the committee. “In the late 2000s, two of Huffman’s cannabinoid compounds began being sold in Germany as marijuana alternatives known as K2 and Spice” (Wikipedia). In an interview Professor Huffman, said the spread of his Spice recipe was inevitable. The recipes got blind reviewed, then published in a tier-one journal: The Journal of Organic Chemistry. See Huffman, J. W., Zhang, X., Wu, M. J., & Joyner, H. H. (1989). Regioselective synthesis of (.+-.)-11-Nor-9-carboxy-. DELTA. 9-THC. The Journal of Organic Chemistry, 54(20), 4741-4743. The 1989 article reports that Professor Huffman and his research team had a National Science Foundation (NSF) grant, and a Robert A. Welsch Foundation grant to fund their university research. The Spice (Synthetic Approaches to Cannabinoids) constitute a fractal. Like coastlines, snowflakes, sunflowers, or our very own Milkey Way Galaxy, a fractal is a recurring, self-similar pattern at progressively smaller or larger scales. Benoit Mandelbrot, in 1975, invented the term, ‘fractal’ (based on the Latin word frāctus, meaning broken or fractured). The recurring spread of the Spice-Fractal, from its inception in a ‘Breaking Bad’ Heisenberg professor’s university lab, complete with NSF funding, and IRB approval, its spread to Germany to imitate the recipe to produce, distribute, and sell synthetic cannabinoid compounds, had replicated to a global scale, a global business, with vast profits. What is Spice? “Synthetic marijuana is a designer drug in which herbs, incense or other leafy materials are sprayed with lab-synthesized liquid chemicals to mimic the effect of tetrahydrocannabinol (THC), the psychoactive ingredient in the naturally grown marijuana plant (cannabis sativa)” (drugs.com). What is the Spice-Fractal? Spice-Fractal is a recurring, self-sameness at higher and lower scales, as the business of producing, distributing, and selling Spice (K2) to consumer-users takes class, in the everydayness business practices in a small city like Las Cruces, or in every major global city on Earth. Spice, invented in a university by Professor Huffman in 1984, spread to a business lab in Germany in2000, and “‘Spice’ or ‘K2’ first became available in the U.S. in 2008” (IBID.). 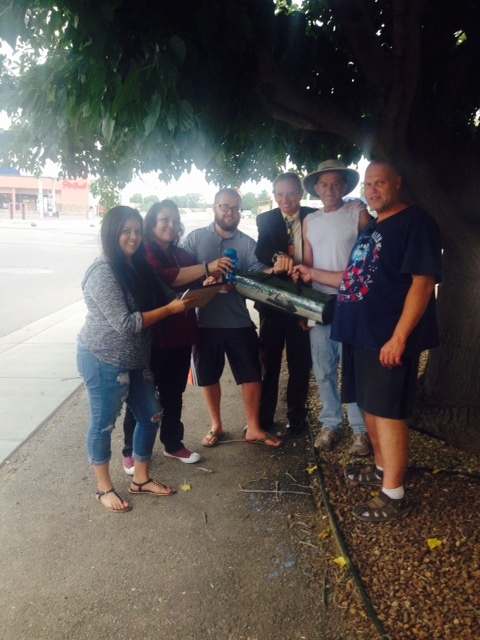 And Ernest and I purchased Spice on Valley Boulevard, Las Cruces, New Mexico on September 11, 2015. Professor Huffman built an entire publish or perish career on Spice (source), but keep in mind he was helped every stp of the way bye the IRB, NSF, and the whole game of academic publishing. Spice-fractal has spread globally, and is apparently unstoppable. “Spice or K2 became increasingly popular with high school students and young adults because it was legally obtainable from convenience stores, smoke shops, and online – until July 2012 when a national ban was enacted against the sale of synthetic cannabinoids in the U.S.“(drugs.com). 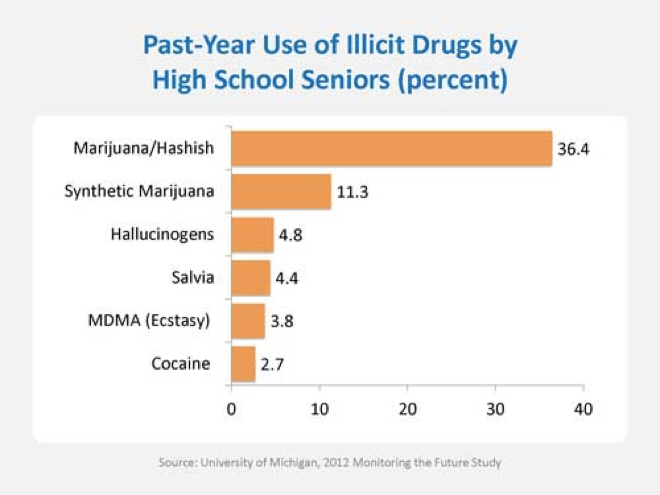 In the 2011 ‘Monitoring the Future’ survey of adolescent use of Spice by 11% of high school seniors, it was second only to actual marijuana-use among 36% high school seniors. The Spice-Fractal spread is now to even younger students, and to the college market (Johnston, O’Malley, Bachman, & Schulenberg, (2013). Across the street from the main campus of New Mexico State University, is a pipe shop, where like the Valley location smoke shop, the business, stopped selling actual spice. Recently, “The Drug Enforcement Administration (DEA) has designated many active chemicals most frequently found in synthetic marijuana as Schedule I controlled substances, making it illegal to sell, buy, or possess them. Manufacturers of synthetic marijuana products attempt to evade these legal restrictions by substituting different chemicals in their mixtures, while the DEA continues to monitor the situation and evaluate the need for updating the list of banned cannabinoid derivatives”(drugs.com). Spice-fractal, its spread, is Big Business! Spice is an $8 billion dollar industry (http://2themax.org/?p=349). The business of the Spice-fractal-industry is the manufacture, distribution, marketing, and sale of Spice. “Across the country, agents seized more than five million packets of finished designer synthetic drugs, including substances marketed as bath salts, spice, incense, K-2 and plant food, according to the federal Drug Enforcement Administration” (Spice News). The spice-fractal must spred for business to prosper, for customers to obtain the product from distributors, for new Breaking-Bad-Labs to corp up to come up with new recipes to keep Spice legal, avoid DEA entanglements, and keep an $8 billion dollar global industry growing. By Veterans Theater working on the Spice-Fractal case, tracing the history of Spice-fractal from its IRB application, its spread to Germany, then USA, its growth into a global industry, we have to account for the falling of so many veterans into the abyss of seizure, dishonorable discharge, and even suicide. On April 30th, 2015 on the NMSU campus, and August 4th, 2015 at the Good Samaritan, Veterans Theater did scenes about the Spice-Fractal, the Spice Epidemic, for sold out audiences. 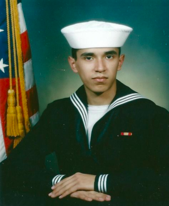 On that stage, each time, we invited the parents of 8 year Navy man, Adam Hernandez, who was 28 years old, stationed in Hawaii, and hooked on Spice, then committed suicide. His mother Ruth Rivas started doing awareness campaigns in El Paso Texas. http://spiceisnotnice.com Trying spice was his deadly mistake. He began playing Russian Roulette with his life. “Each branch of the military has a record of punishing service members who have been found guilty of using this drug. Penalties can include prison time, confinement, loss of rank, and dishonorable discharge” (comilitary). “In the Army, the use of noncontrolled intoxicants – to include natural substances – is prohibited under Army Regulation 600-85 (Army Substance Abuse Program). The Army has taken a proactive stance on addressing the dangers of Spice. A violation can lead to disciplinary action, which may range from a reprimand to a dishonorable discharge. A Spice user may have no idea what he or she is being exposed to, due to the high quantity of other synthetic materials contained in the drug. Veterans Theater is tracing the constitution of the global enterprise, the spread of the Spice-Fractal, from the lab to the rush that is anticipated, and falling down into the abyss of death, if your number comes up. This is radical street theater, not the safe environs of a Center for Performing Arts. The Being of this Spice-Fractal, its spread qua business profits-in-suicides per capita, takes care of the business life, the fore-having of Spice recipe changes in a lab, the fore-sight to ante (the bet) on the future of addicted souls, the between fore-structure of global distribution, the fore-conception of the lab study concepts from the very onset of this industry, to the becoming of the business’ care for its product, to keep one step ahead of DEA enforcement. That is what the Spice-Fractal is, and what it is all about. I am a business professor, and write about the ethics of business practices. When the business of business is death, do we not as business professors, have a moral and ethical answerability, a responsibility to do Street Theater, to bring awareness about the business of this man-made epidemic. If you got this email, what would you do? “We had a big problem with Spice these past few days. Another death, one that police and hospital trying to locate family he is brain dead and in one day we had seven people fall out and taken to the hospital because of smoking Spice. That very same day the mission had six and in the city they counted over 21 carried to hospital for smoking spice. This was Thursday evening and it almost seemed like a terrorist act was committed because it was none stop all over the city. Friday we had three and Saturday we had two. The police are saying it was a very deadly batch and the same yellow ole pickup that I have been watching for months for dealing is involved. Police are following up leads and I even took pictures to show what this guy has been doing. It has been a very long and stressful week and I believe that this is only the beginning” (email from Iraq War homeless veteran received June 14 2015). A fractal is the iterating pattern of self-sameness across micro to macro scale, and vice versa. The Spice-Fractal must flow globally and locally along the jagged-fractal-coastlines, distributing the faux Marijuana to unsuspecting users, who think they can get a high on the cheap. Its use and market share is growing. German Duarte (2014: xiii) argues that since Benoit Mandelbrot’s fractal geometry of the 1970s, the ‘fractal narrative’ has become popular in films, novels, and visual graphics of storytelling. “Fractal narrative” is defined as “a narrative that finds its best accomplished form in the Web” in hyperlink networks (Duarte, 2014: 284). He observed that since Mandelbrot’s fractal geometry, the fractal narrative took root in film and novels, and even in recent Disney movie songs about fractals (see also Palumbo, 2002). Star Wars, Star Trek, Avatar, Dune, etc. have fractal narrative iterations of self-sameness across scalabilities. They are monologic plots, the heroic characters on the Romantic Adventure (chronotope, as Bakhtin call this spacetime). The Spice-Fractal is the spreading spiral pattern, across an $8 billion dollar global business, turned epidemic. Swallow this Vurt, and you are on a bad trip, to addiction, perhaps to your own death. The spreading fractal pattern is through the Situational Hermeneutics of a professor fore-having, the fore-conception of synthetic language, the recipe that became a fore-structure of industry, and the fore-sight of that industry to sell addictive products to users, while labeling them ‘not for human consumption’ and the entire becoming of care for the sustainability of the Spice global industry in the face of DEA pursuit. To counter a Spiral-Fractal with Veterans Theater street theatricality, is to make space for veterans stories, stories of the business of Spice, gone Global. Boje, D. M. (2015). Change Solutions to the Norms and Standards Overwhelming Organizations. Organizational Change and Global Standardization: Solutions to Standards and Norms Overwhelming Organizations. Boje, D. M., & Henderson, T. L. (Eds.). (2014). Being Quantum: Ontological Storytelling in the Age of Antenarrative. Cambridge Scholars Publishing. Duarte, G. A. (2014). Fractal Narrative: About the Relationship Between Geometries and Technology and Its Impact on Narrative Spaces (Vol. 12). transcript Verlag. Henderson, T., & Boje, D. M. (2015). Organizational Development and Change Theory: Managing Fractal Organizing Processes. London/NY: Routledge. Huffman, J. W., Zhang, X., Wu, M. J., & Joyner, H. H. (1989). Regioselective synthesis of (.+-.)-11-Nor-9-carboxy-. DELTA. 9-THC. The Journal of Organic Chemistry, 54(20), 4741-4743. Mandelbrot, Benoit B. “Comments on:” A Subordinated Stochastic Process Model with Finite Variance for Speculative Prices,” by Peter K. Clark.”Econometrica: Journal of the Econometric Society (1973): 157-159. Noon, J. (1993). Vurt, Littleborough. Cohen, J., Morrison, S., Greenberg, J., & Saidinejad, M. (2012). Clinical Presentation of Intoxication Due to Synthetic Cannabinoids. Pediatrics, 129(4), e1064-e1067. What is Storytelling Relational Processes of Veterans Situation in the USA? Storytelling is the total of all involvements in the spacetimemattering of a context, in this post, the veterans of the USA. Here we focused on the system of health care veterans receive and the storytelling relational process that constitutes the ‘meaning of care’ for veterans Being-in-VA-Health-care. “One of the principal problems with the delivery of health care in the United States is its uncoordinated nature. In particular, patients with multiple chronic conditions may be seeing multiple physicians who do not talk to each other, leading to overlapping prescriptions and in some cases, dangerous mistakes. ‘Badly coordinated care, duplicated efforts, bungled handoffs, and failures to follow up result in too much care for some patients, too little care for others, and the wrong care for many’ observed Katherine Baiker and Hellen Levy in 2013” (see p.age 50 of the report). For every narrative about the successful delivery of quality care to veterans, there are counternarratives about the bungled handoffs, failure to follow up and the thousands of veterans that died waiting for an appointment to get care. Besides the narratives and counternarratives about the generalized picture of veterans health care in the USA, there are the actual lived experiences of individual veterans their ‘living stories’ of places, times, and mattering of health care delivery. Finally, there are the antenarrative threads out of which the dominant (grand) narratives (& counternarratives) of veterans’ healthcare, and the living story web of the veterans experience — are constituted. Antenarratives are the ‘what’ of narratives and living stories, the lies before, beneath, between, the bets on the future, and the becoming of care that is ‘not yet.’ For more on antenarrative, please consult the Antenarrative Blog. Our focus here is on the complexity dynamics of the entire storytelling patterns, the interplay of narratives, stories, and antenarrative threads. We call this ‘Quantum Storytelling’ dynamics. And we are doing an annual conference, this year in Los Angeles in December http://bigstoryconference.com. But, the counternarratives, question: are veterans really getting the healthcare they deserve? El Paso has longest wait for VA mental health appointments in U.S.
Next, we leave the narratives and counternarratives and look at the living stories. A living story has its place, time, and mattering in spacetimemattering. 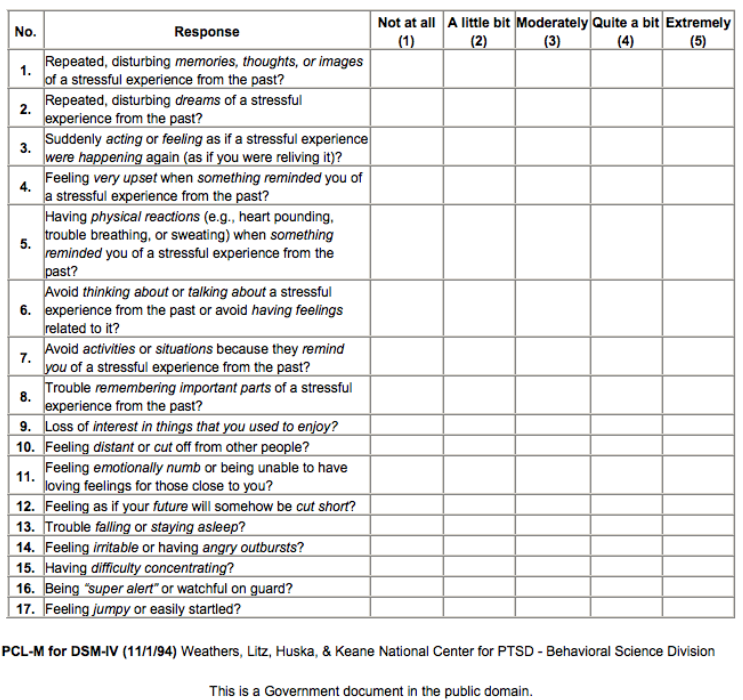 I am a Vietnam-veteran.I came home with PTSD, but there was no such diagnostic category, until 1980. Half the homeless US veterans are Vietnam era. 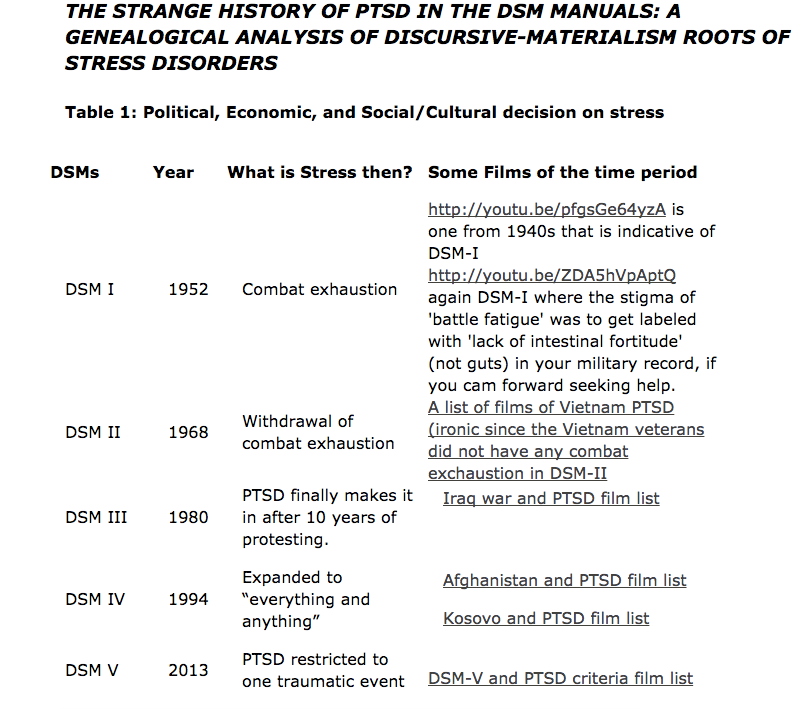 APA changed the DSM manual for our generation, not admitting PTSD until the 1980 edition. My own living story is coming home from a year’s deployment in Vietnam war, on 29 July 1970, I was cautioned to take off my uniform, put on civilian clothes, and toss the uniform into the trash, lest I be mobbed by protesters. So I arrived in Oakland, on a TWA flight, and did as instructed. We were not given a welcome by the nation, nor did airlines ask us to board first, or thank us for our service to the country. No, the nation saw the nightly news, the ways the war was not going well, and so on. I was assigned to Fort Dix, New Jersey, where I served out my remaining time in the Army until 28 January 1971. I got an early out to attend college, the first in my family tree to do so. I enrolled at Burlington County College (now Burlington County University), moved the family into a Princess 60 foot mobile home, in Browns Mills, New Jersey. Table is from http://davidboje.com/Warwick/ which has more on history of DSM. The point is when I came home from Vietnam, with what is now PTSD, the psychologists had written out stress from trauma, from their manual. DSM IV expanded PTSD to just about everything, and now, PTSD in DSM-V is only for a particular battle, that meets certain criteria (see http://www.ptsd.va.gov/professional/PTSD-overview/dsm5_criteria_ptsd.asp). To make a long story short, I am home addicted to alcohol, and full of stress I did not know what to do with, except to channel it into work. So two addictions, alcohol and work were my way of dealing with it. Like most veterans I did not go near the VA except to get education or mortgage loan money. And in fact, never did use VA treatment. Instead I got into self-improvement seminars, and got some marriage counseling. I was a A student all the way through college, graduated tops in my class at Burlington University’ two year program, and again at Rider University’s 4 year program. This got me a fellowship to University of Illinois, a pass into the MBA, then acceleration into their Ph.D. program, and UCLA was my first assistant professor job. I drank a six pack every day and two on weekend days, from 1970s through to about 1994. I always drank after doing my work. 21 years ago, I stopped drinking, and went through divorce, and bankruptcy, since in Las Angeles, could not afford one household, and when the X took off to New York with the kids, and bought a new car, all I could do was go into the downward spiral of divorce and bankruptcy. I decided to quit the booze, and that turned things around. One time I took the MMPI and a psychologist told me he could cure my workaholism, but it would mean I would not be a prolific a publisher. I said ‘no way’ and never went back. So my living story of my struggle with stress, how it got hold of me, in Vietnam, and let it run its course as a marriage of 25 years destructed, and I learned the ‘true’ mean of deconstruction, and reconstruction. In my new marriage, horses came with the package, along with the requirement I get some real counseling, which I did in 1995, and since. Now I have a small ranch, loving marriage, and meditate and try to tame the workaholic monster. The antenarratives are threads of intention that constitute the narratives and living stories, and are what constitutes all the involvements of storytelling in a context of spacetimemattering. How is antenarrative a relational process of organizations and their participants’ storytelling? Quantum storytelling is an ontologic analysis of ongoing patterns of the storytelling, including the a of antenarrative: the cycles, spirals, and rhizomatics of those patterns. Organizational Change and Global Standardization: Solutions to Standards and Norms Overwhelming Organizations by David M. Boje (Editor) 2015) (Routledge Studies in Organizational Change & Development)Hardcover – Available now. Organizational Development and Change Theory: Managing Fractal Organizing Processes by Tonya Henderson (Author),David M. Boje (Author)Available August 1st 2015 – available Routledge. In sum,Storytelling is the total of all involvements in the spacetimemattering of a context, the interplay of narratives (counternarratives), people’s living stories, and the antenarrative threads between-beneath-before-bets and the becoming of care. For care to take a different shape for veterans in the USA, we need to understand not only the base, but the future, the potentiality-for-Being of the becoming-of-care in authentic ways for our veterans. How does Wealth of War Corporations and the Super-rich relate to Madness, Homelessness, to Veterans Issues? The super-wealthy live alongside homelessness. The War Corporations need humans to become ‘Mad Warriors’ and to supply them with equipment. The War Corporations feed on madness and produce madness. “There is no madness but that which is in every man, since it is men who constitute madness in the attachment he bears for himself and by the illusions he entertains” (Michel Foucault, 1980, Madness and Civilization, p. 26). There is madness across the USA. “In Silicon Valley, abundant wealth commonly lives alongside absolute squalor. The same county that houses Yahoo!, Google, and scores of other digital money mines is mired in a costly ongoing failure to address rampant homelessness” (ThinkProgress). In California, “Santa Clara County spent nearly $200 million per year on justice system costs involving homeless people. The vast majority was spent jailing people with nowhere to live” (IBID.). They had 33 separate laws on the books criminalizing homelessness, including a law against sleeping in cars. The forces of madness are not confined to the Asylum, the Hospital, or the Ship of Fools. Rather, madness is now everywhere, and there are great profits to be made from madness. No where are those profits higher from madness, than in the War Corporations. Wars spread madness. Wars need warriors, to do the work of corporations. Let’s deconstruct (take apart) the trope of madness, in-order-to, better understand its meaning for ‘real life’ of war. 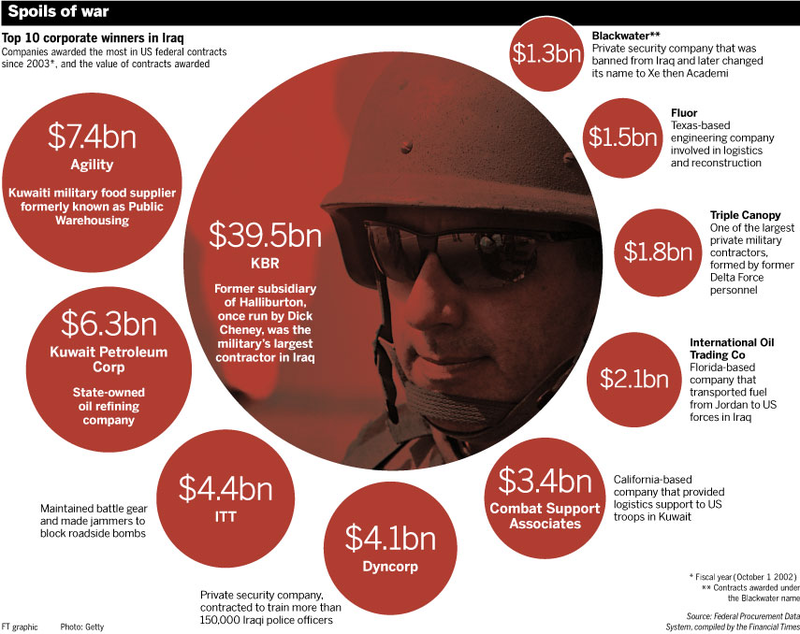 War is rife with conflict, death, and destruction, yet many corporations are profiting. The corporations lose money without war. The nation pays for its warriors for four to six decades, meanwhile Congress allocates more money for weapons of war, but cuts the budget for the warriors wounded in war, needing care for many decades. Corporations profit from the the madness of poverty. Corporate America profits from poor people. Wealth accumulates to the .001% of the population, while almost 50% of the world lives on less than $2 a day. Income inequality between the super-wealthy and the super-poor, is want makes for extreme differences in health, nutrition, infant mortality, sanitation, and other aspects of human well being. The richest 1% own more wealth than the remaining 99% of the population. “The super rich can view the lower classes as subhuman. It is very hard to justify your huge wealth unless you see people beneath you as less deserving. Once the wealth gaps become very large, it is easier to get through the day if you see them as less able, less special” (Guardian). MYTH: Wealthy corporations believe they deserve the wealth, since they work harder than the poor. REALITY: “In reality, a large and growing portion of the super-rich have never broken a sweat. Their wealth has been handed to them” (Salon). MYTH: Work, hard and you can be part of the American Dream. REALITY: USA is becoming two groups, the working poor, and the non-working super-rich, who assume they are paid their worth in gold (Salon). You guessed it, the CEOs of the corporations profiting from the Iraq and Afghanistan ware are the top .01%, and make the rules of the game. 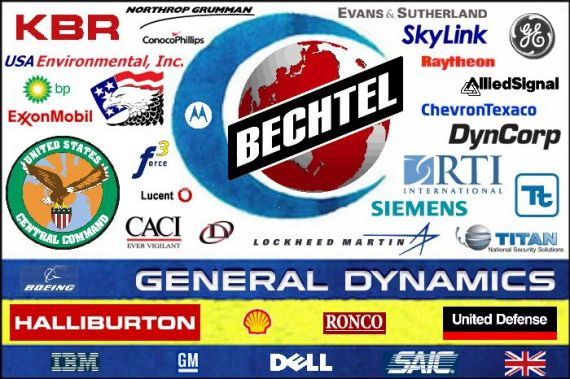 “There’s the top 1% of wealthy Americans (bankers, oil tycoons, hedge fund managers) and there’s the top 0.01% of wealthy Americans: the military contractor CEOs” (Huffington Post). “More than a third of the world’s super-rich live in the U.S., with roughly 27% in Japan, 6% in the U.K., and 5% in France. The world’s richest 10% accounted for roughly 85% of the planet’s total assets, while the bottom half of the population – more than 3 billion people – owned less than 1% of the world’s wealth” (Alternet). Here is an idea: Let the Super-Rich War Corporations pay for Solutions to the Problems of Veterans Health Care, and the Homeless across the USA. One Solution: The pathway from HOMELESS to HOMED –>Above homeless in London are SPIKED to keep sleeping rough, in camps across America there are tents but ‘Oh so cold in winter’ and in tent 130 degrees in summer sun, so why not build some Tiny Homes, and transition all the way to economic sustainability, off-the-grid electric, on wheels to move to great locations. There is a source of poverty, the profiteers of war, and they could pay for the cabins. “A new report commissioned by Loving’s group and the Santa Clara County Board of Supervisors details how the valley has failed in its fight against homelessness, and at what cost. All told, county communities spent more than half a billion dollars per year hospitalizing, jailing, and providing social services to about 104,000 individuals who were homeless for some portion of the six-year period of the study. Health care spending ($312 million per year) was the bulk of the cost, with justice system spending second. “The extensive analysis by Economic Roundtable researchers who cross-referenced 25 million separate records offers a clearer understanding of why the county’s costs were so high – and how policymakers could create a financial windfall by giving homeless people houses and direct support services. About 60 percent of all county spending went to just 10 percent of the homeless population, fewer than 3,000 of whom were identified as chronically homeless and in need of more intensive and targeted aid. “Providing permanent housing with supportive services attached for those most-expensive persistently homeless individuals would have saved about $42,700 a head compared to the cost of leaving them to their own devices. That means that even if Santa Clara communities ignored the types of homelessness that afflicted the other 101,000 people in the study and concentrated solely on the persistently homeless, it could have saved $120 million a year. But Destination: Home’s recommendations based on the report go beyond such narrowly-targeted permanent housing work” (ThinkProgress.org). We have gone from War on Nations to War on Drugs to War on Poverty and the War against Homelessness. The War on Drugs has turned into War on Poverty: With 5% of the world’s population, USA has 20% of the prison population. Some two million people live behind bars in the USA. 37% of black high-school dropouts are incarcerated. These are the people that cannot afford bail, not able to leave jail and conduct defense investigations. “While only 8 percent of federal prisoners were sentenced for violent crimes in 2011, almost half of federal inmates – 48 percent – were in prison for drug crimes, according to Department of Justice statistics.Jan 2, 2013″ (ThinkProgress). “We are punishing people for their poverty,” Nick Turner, executive director of the Vera Institute, told CBS MoneyWatch. “When we looked at the data, we found 75 percent of the population of people in jail are awaiting trail and are there for nonviolent offenses. That is mind-boggling when you think the country spends $22 billion on jail populations.” (IBID). “jails admit 11.7 million people annually, almost 19 times the 631,000 who go to state and federal prisons every year” (IBID.). “In addition, those behind bars are staying longer. Some 62 percent of them have not yet been convicted of a crime, and three-quarters of those jailed now are brought in for nonviolent offenses. The report also finds that a disproportionate number of those in jail suffer from mental illness” (PBS). Many people look at the homeless as the madness, but what if the wars produce the madness? The wars cost money. It takes less money to get at the root causes of the madness, than it does to put poor people in prison, in day shelter, and blame them for all the madness, most of which is done to increase the wealth of the .001% who are not paying their fair share for the long-term costs of war. What about Veterans and Prison? VA AND DEFENSE CHIEFS CONFRONT REALITY OF 700,000 INCARCERATED VETERANS (source). “More Iraq War Veterans are Landing in Jail but Most Counties Don’t Track Soldier Inmates“. It takes a Heart-of-Madness to create profit from poverty. It takes a Heart-of-Care to come up with solutions to the madness. Poverty and madness are necessary to wealth. Why else would almost half the 7.3 billion people on this planet make less than $2 a day? Poverty is necessary to wealth, but how is madness related? Being overwhelmed in a fight, the madman gets in touch with animality, like the mythic Wolverine, Hulk, and of course, Thor. Thor, the Asgardian God of Thunder, son of Odin and the Elder Earth-Goddess Gaea. Thor, armed with his enchanted hammer (Mjolnir) is arguably the greatest and mightiest mad warrior. 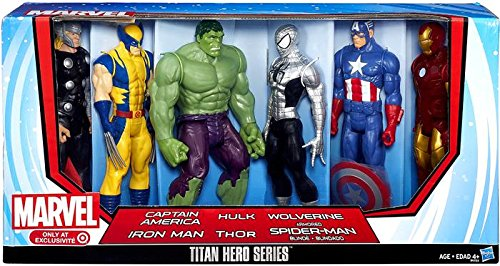 Or get the Marvel Titan Hero Series 6 Pack with Armored Spider-Man, Captain America, Iron Man, Hulk, Thor, Wolverine (Marvel 6 Pack). These are the icons of military warrior, turned to help USA in the sea of madness. Mad warriors in the USA are understood through the archetypes of Thor-Wolverine-Hulk-Spiderman-Captain America-Iron Man and have become a fractal-narrative. “Fractal narrative” is defined as “a narrative that finds its best accomplished form in the Web” in hyperlink networks (Duarte, 2014, p. 284; as cited in Boje, 2015: xxvi, emphasis mine).Thor-Wolverine-Hulk-Spiderman-Captain America-Iron Man have entered the hyperlink networks, the film and comic book genres. The berserker warriors of old, the Viking Mad Warriors, the Warriors of Apocalypse Now, and Deer Hunter, from the Vietnam War era. Definition of Fractal-Narrative: “A fractal narrative has heroes in recurring patterns of adventure with their sidekicks” (Boje, 2015: xxvi). On their hero’s journey, the find helpers, get defeated, bounce back, bring home that boon to save the day. Definition of Fractal-Story: On the other hand, “A ‘fractal story’ is defined here as a web of of fluid ‘living story; interrelationships between urban chaos and fractal-cyberorder that is centrifugal, veering away from order toward anarchism, discontinuity and erratic, violent urbanism” Boje, 2015: xxvi). Definition of Fractal-Antenarrative: The fractal antenarrative is different than these other fractals,. The Fractal-Antenarrative is the before-bets-beneath-between-becoming patterning, what Jeff Noon (1996) the “randomologist” calls the Vurt, sometimes in pattern of ‘downward fractal-spiral’ (XXiX), e.g. the coward frlactal-psoiral of the eco-system with loss of more and more species, extinct by unintelligent action as John Dewey calls it (Boje, 2015: xxxii). Thor-Wolverine-Hulk-Spiderman-Captain America-Iron Man are characters in futuristic dystopia of our own 21st century. The solicitude of prisons, police, shelters, missions, and so on, await the Mad Warriors, returning from war, into peacetime. The authenticity of Being-Mad-Warrior has no place in civilized USA.